The Community Players of Hobbs: Just four days until the 2015 season opens! Just four days until the 2015 season opens! This Friday, "Things My Mother Taught Me" opens on the Playhouse stage! "Things My Mother Taught Me" is the story of Olivia and Gabe moving into their first apartment together. They've just packed up all of their belongings and driven halfway across the country, to start a new life together in Chicago. Their moving day doesn't go exactly as planned, though, and things become slightly more complicated when all of their parents show up to help! Can a two bedroom apartment contain all of the love, laughs, worry, and wisdom that's about to happen? 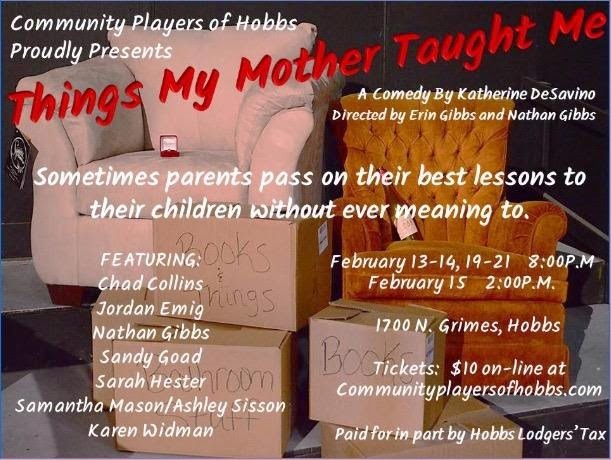 "Things My Mother Taught Me" is directed by Erin Gibbs. 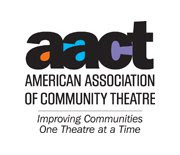 Show dates are February 13th & 14th (8 PM), 15th (2 PM), 19th, 20th, 21st (8 PM). Congratulations to the cast of "Endgame"
UPDATE: AUDITIONS EXTENDED Auditions "Endgame"